A crochet pom-pom beanie hat, made in sc, using worsted weight yarn and a 5.00mm hook, this one matches my adult mitts pattern, when put together they would make someone a lovely gift set. See my FREE crochet Sedge Stitch Slouch & Frilled Brim hat — patterns. Row 8 – ch1, 2sc in base of ch1, 1sc in each of next 6sc, * 2sc in next sc, 1sc in each of next 6sc, * rpt from * to * to end, sl st to first sc on beginning of row. Fasten off. Row 14 – ch1, 1sc in base of ch1, 1sc in each sc to end, sl st to first sc on beginning of row. Turn. Row 15 to 35 – Rpt Row 14. Fasten off. Turn. Row 36 – Join in Color 1 and rpt Row 14 once. Fasten off. 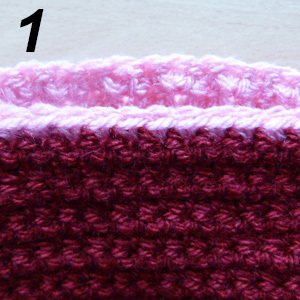 Brim – Using color 1 ch11, 1sc in 2nd ch from hook, 1sc in each ch to end. Turn. 2nd Row – Working in blo (see abbrev) ch1, 1sc in base of ch1, 1sc in each sc to end. Rpt 2nd Row until 78 rows have been worked in all. Fold work in half (from bottom to top) so that the short sides of both ends are lined up, sl st along through both sides of work to make a round. Turn your work on to the side so you are working in the row ends. ch1, work 1sc in each of next 78 row ends to end, sl st to first sc on beginning of row. With RS of hat facing, working along Row 36, place brim on the — inside of the hat, (see pic 1) sl st into each of the next 78sc to end working through flo (see abbrev) on hat and both loops on brim (see pic 2) sl st to first sl st on beginning of row. Fasten off. Fold back brim on to front of hat (over the sl st). Working in loose loops on bottom of brim, work one row of crab stitch (see abbrev) along to end, sl st to first sc. Fasten off. 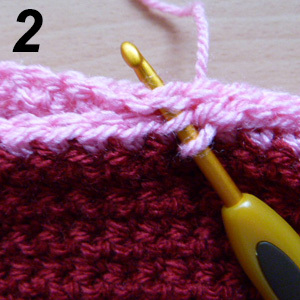 Finishing – Weave in and trim off the loose ends of yarn, attach the pom-pom to brim decoratively. Hope you have fun making this crochet pom-pom beanie hat, don’t forget to pin it. 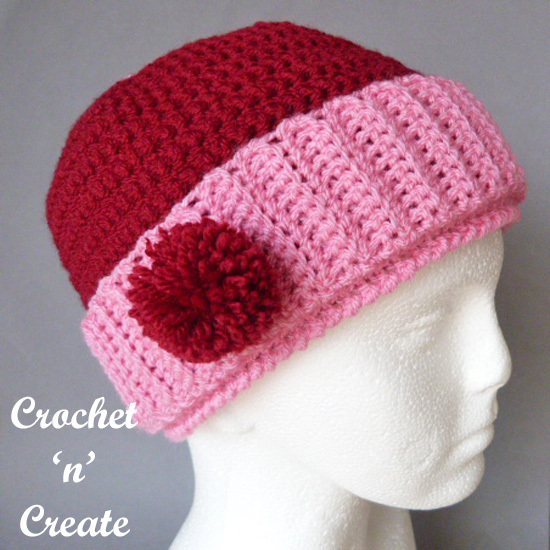 The written instructions and pictures for this free crochet pom-pom beanie hat pattern are copyrighted to crochet ‘n’ create © 2018. 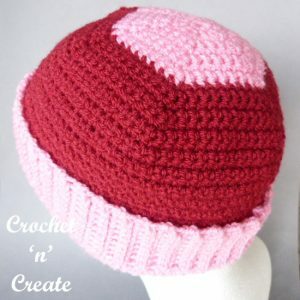 You are welcome to sell the finished products made from the free crochet pom-pom beanie hat pattern, I just ask that you please use your own pictures and put a link back to crochet ‘n’ create. DO NOT share the written instructions for this crochet pom-pom beanie hat pattern. This entry was posted in beanie hat and tagged crochet, crochet beanie, crochet hats, free crochet patterns on 23rd January 2018 by crochetncreate.